The town is actually a cluster of old villages, which originally developed around individual pagodas and later overlaid with a French colonial-era center. Note the colonial and Chinese-style architecture in the town center and around Old Market. Designated a World Heritage Site by UNESCO, the Angkor Archaeological Park encompasses dozens of temple ruins including Bayon, Banteay Srey and the legendary Angkor Wat whose artistic and archaeological significance and visual impact put in a class with the Pyramids, Machu Pichu and the Taj Mahal. Khmer is the official language of Cambodia. 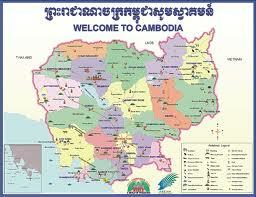 The Cambodian language is derived from the Mon-Khmer (Austro-Asiatic) language family. It is renowned for being one of the largest set of alphabets; it consists basically of 33 consonants, 23 vowels and 12 independent vowels. Tourist may wish to learn a few spoken like "Thank You" stand for "Or-Kun", while "Hello" stand for "Sour s'Dey". However, English is widely spoken and understoond. French is the secon language after English; most elderly Cambodian speak French. The Chinese language is also widely spoken. Like most of Southeast Asia, Cambodia’s climate is hot and warm almost all year round. The climate is dominated by the annual monsoon cycle of rainy and dry seasons. The rainy seasons lasts from May to October, and the dry season from November to April. December to January is the cool months while the hottest period is in April. The average temperature is 27-28C. 9.Samrong (Cambodian side) and Mi Quy Tei (Vietnamese side) On the Cambodian side, the Samrong international border checkpoint is located in Svay Rieng Province, and on the Vietnamese side, the Mi Quy Tei international border checkpoint is located in Long An Province. Tourists can get access to Cambodia from Vietnam through the gates. Visas on arrival are available there.